Latin American Harpist, Singer, Composer and Poet El Condor, from an early age has been an eminent representative artist of Latin America, nationally and internationally, on a wide variety of stages. He is considered today an ambassador of the Latin American poetry and music culture and one of the finest soloist composer-performers of the land. Ricardo studied the harp in Colombia, his native country, at the Music Academy of Villavicencio, with Luis Alberto Curvelo, his brother and Director of the institution. The two brothers founded The Music Academy of Puerto Carreño (Vichada). He studied music theory at the Music Academy Luis A. Calbo and voice production with legendary maestro Manuel Zapata Olivella, at the National University in Bogotá. 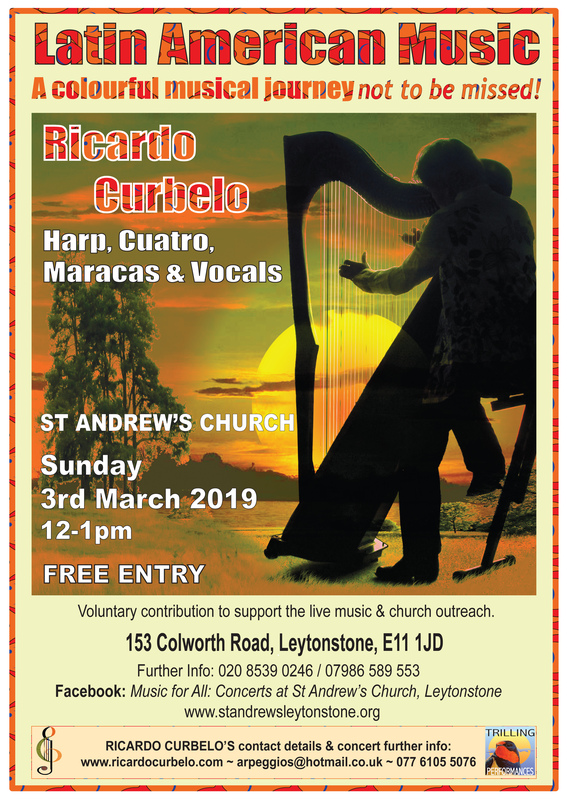 Ricardo's development and commitment, from an early age as a performer, combined with the distinctive sound responses of his Modelo Corvado harps, make him today a solid, unique artist. His entire work is basically poetry; which exceeds to date five hundred compositions. From his works, pieces such as THE HOMO SAPIENS DREAM, bring Latin America’s music and poetry to a new dimension. This dramatic poetical-progressive interpretation of human evolution has been much acclaimed by audiences. In 2010, thanks to this piece, Ricardo was presented as the perfect act for the day at the London Natural History Museum, during the Exhibition Road Festival. In the UK his artistic career has expanded quite remarkably. He has widely performed solo concerts and with different accomplished performers from around the world. Copyright © 2005. Ricardo Garcia-Curbelo. All rights reserved.